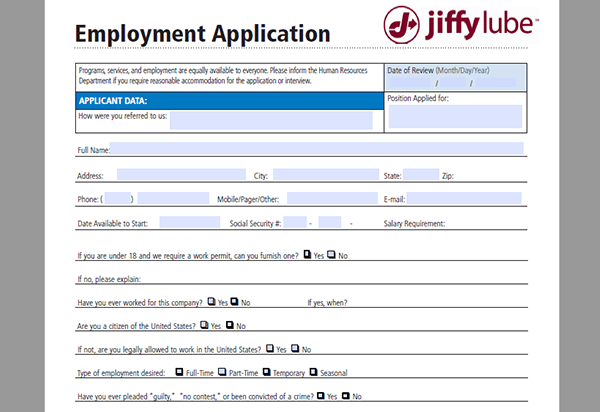 Download the Jiffy Lube job application via the links provided on this page. Follow the steps in the below guides to learn how to find locations in your area, as well as how to properly fill out the application. About the Company: Jiffy Lube is an American chain of automotive maintenance centers that primarily provides oil change services. The company has more than 2,000 locations throughout North America with all of them being independently owned/operated. Jiffy Lube was founded in 1971 and is headquartered out of Houston, Texas. Step 1 – Although you cannot directly apply online, click this link to open the careers page. Step 2 – Click the “Browse All Locations” button. Step 3 – Enter your zip code into the input field and click the black button to load the results. Step 1 – Download the .PDF document by pressing the link at the top of this page. If you are under 18 can you provide a work permit? If no, can you legally work in the United States? Have you ever pleaded guilty or been convicted of a crime?